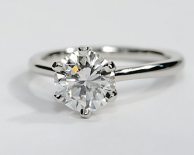 This is a great choice for those looking for a solitaire engagement ring with a wider shank. 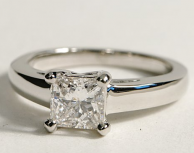 This platinum band widens slightly as it approaches the four-prong setting for the center diamond. This ring can be set with a round, princess, or asscher cut diamond.